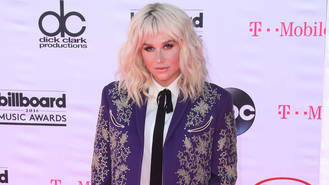 Kesha is offering to kiss anybody who finds her stolen custom jacket and returns it to her. The Tik Tok singer posted an expletive-ridden video on Instagram on Monday night (08Aug16) claiming her suit jacket had been stolen from her dressing room before making an emotional plea for it to be returned before her next show. "It is black with a tiger on the back with a rainbow on it," she describes in the video. "It just showed up on Instagram. If you can get me my f**king suit, I don't know what I'll do, I'll kiss you on the f**king mouth but I need it for my show tomorrow. If someone finds it, if someone could get it, I'll do something great for you but please I need that f**king suit by tomorrow night at 9 o'clock. I love you, bye." In the video caption, she told fans she will be "forever indebted" to the person who finds the clothing item and then directed them to a picture of the jacket on a fan's Instagram page, which had been posted an hour earlier. Kesha asked the user where they found the picture. The fan has since been accused of stealing the jacket and has private messaged Kesha to protest their innocence. Kesha is due to perform in Cleveland, Ohio on Tuesday night (09Aug16) as part of her F**k The World summer tour which concludes in Louisville, Kentucky on 23 August (16). The shows are Kesha's first proper tour since a judge denied her bid to be released from her contract with Dr. Luke's Kemosabe Records and Sony Music in April (16). She had wanted to be free from the deal so she doesn't have to work with the producer, who she claims physically and emotionally abused her, allegations Dr. Luke has denied. She recently dropped the legal case in Los Angeles so she could focus on her music, but is continuing proceedings in New York. Tom Odell has revealed Ricky Gervais is one of his biggest fans. Adele is in talks to perform at the Super Bowl 50 halftime show in 2017. Jonathon Antoine would love to release a death metal record. Biffy Clyro are inviting fans to star in their new virtual reality music video. Adele has donated to various charities after opting out of appearing on the Glastonbury 2016 fundraising album. Beyonce is in talks to perform at the MTV Video Music Awards 2016. Ronnie James Dio closed a music festival on Saturday night (06.08.16) - as a hologram. Kesha has labelled her legal battle with Dr. Luke "the hardest years of my life". David Bowie gave his seal of approval to the 'David Brent: Life On The Road' soundtrack.